Weather made for difficult conditions at the track, which has been idle as owners sought a general manager. UNITY — Ever wonder what it would look like to see Metallica play James Taylor? James Hetfield was not belting out his signature notes at Unity Raceway on Sunday and the “Sweet Baby James” singer was not there either, yet the day had just about everything else. Staff photo by David Leaming Car number 77 spins out at a turn during races at Unity Raceway on Sunday. 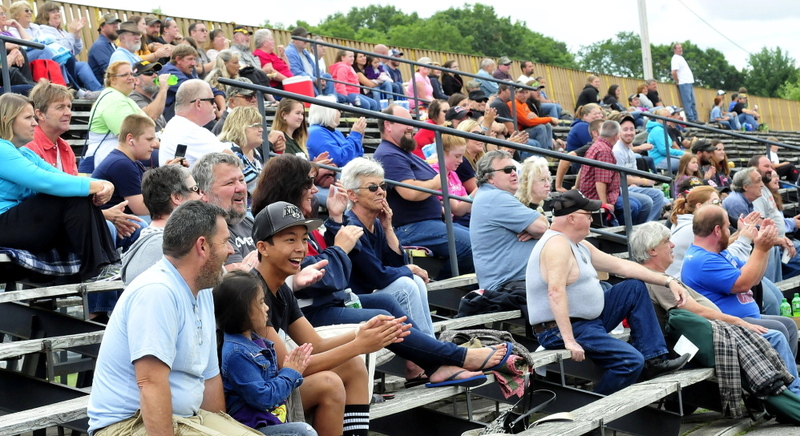 Staff photo by David Leaming Spectators clap for winners of a race at the Unity Raceway in Unity on Sunday. It had fire and it had rain, and — most importantly of all — it had racing. It has been a tumultuous last year for Unity, as the track sat idle in search of a general manager to operate it. Under the direction of Nick Huff, Unity finally held its first races of the season Sunday and, while the event had its ups and downs, it was overall a solid day. “The rain was an obstacle but we fought through it and it came out pretty good,” Huff said. “It was a really long day, that’s usually not common. This went like five and a half hours and usually race shows are three to four hours. I hope everybody enjoyed it. Rain certainly contributed to the delays — even forcing Huff to shorten the second of the twin 100-lap Superstock Enduros to just 50 laps — but that was not all that led to the long day. Just 18 laps into the first twin Enduro, the No. 25 car of Brad Bellows burst into flames, stopping the action on the track and drawing a red caution. Bellows would be more than OK though, and he would quickly be back in the race — albeit in a different car. “I walked into the pits and my father (Ed) followed me in with his car and we immediately swapped,” the younger Bellows said. Brad Bellows — now driving his father’s No. 9 Nissan — wrecked again on lap 20, catching a flat and ending up in the ditch on turn No. 2. Bellows would fight his way out of the ashes though, as a yellow flag due to rain on lap 61 allowed him to catch back up with the leaders. Fifteen laps later. he took over the lead from Tim Robinson after the alternator went in his black No. 62 Mitsubishi Eclipse. Bellows’ lead, however, would only last for nine laps. The race’s second red flag came out on lap 85 when Robert Dyer’s No. 77 rolled over and landed in the ditch on turn No. 2, and it was at this time race officials were alerted to the fact that Brad Bellows was now driving his father’s car. He was sent to the back of the pack and later disqualified. Robinson briefly held the lead on the reset, but with the alternator failing his car did not have power necessary to keep him in front. Then with five laps to go the race’s first leader, David Folsom Jr., jumped into the lead and held on for the win, as well as the $1,000 prize. While Robinson’s Eclipse did not have the power to carry him to the win in the first Enduro, he did manage to get the victory in the second. Bellows held the lead early on — now officially driving the No. 9 car — but ultimately Robinson worked his way to the front of the pack. He ran into some trouble with lap traffic around lap 30 and struggled to clear it, allowing Bellows to stay in the hunt. Robinson finally got around the traffic with 10 laps to go though, and with open track in front of him, he cruised to the win in the second of the two Enduros. WISCASSET — Chris Bowie drove his Electricity Maine Chevy Impala to the win, making him the second two-win driver in the Late Model Sportsman class at Wiscasset Speedway on Saturday night. Chris Thorne was the first driver to pull off the feat. Besides Late Model Sportsman, the Mini Trucks, Strictly Street, Thunder 4’s and Enduro divisions all saw action. The spotlighted race of the week was a 20-lap Mini Truck feature. Jerry McKenna held off Matt Weil for his third win of the season. McKenna is the current point leader in the division with 444 points while Weil is second with 362. Behind Weil in the race, was Herb Farrar in third place. A 25-lap Strictly Street feature was next in line. Corey Morgan, starting on the pole, was able to hold off Jairet Harrison by .39 seconds for the victory. Dan Brown was third. With two laps remaining Thunder 4 point leader Ryan Chadwick took the lead and held on for his eighth win of the season. Curtis Anderson, the pole sitter, was second while Trey Brown finished third. Chris Bowie earned a 1.4 second win over Allen Moeller in a caution-free, 35-lap Late Model Sportsman feature. Josh St. Clair was third. Over 30 Enduro’s packed the track to start a 100-lap flex race. During lap 93, Brad Clement took the lead only to see Kamren Knowles rally back and reclaim the front spot on lap 96. Knowles held on for the win followed by Jeff Davis, Zach Emerson and Jeff Minchin Jr.